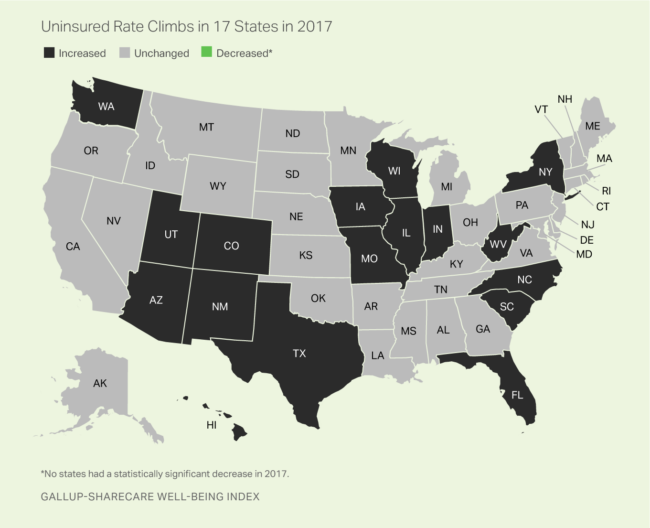 Colorado is among 17 states with rising uninsured rates for the first time since the Affordable Care Act was fully implemented (Gallup). As soon as Donald Trump was elected President in November 2016, political pundits across the country began speculating that Democrats could have a big year in 2018 by running against the Big Orange Guy. Trump will certainly be a big motivator for a significant percentage of voters, but for many Democratic candidates, winning in November may come down to a familiar issue: Health care. …Democrats see reason for optimism in polls from the Kaiser Family Foundation showing that more Americans now view the ACA favorably than unfavorably and significantly more trust Democrats than Republicans to handle health care issues. A wide array of other surveys have found rising health care costs spiking to the top of the public’s list of priorities for Washington. 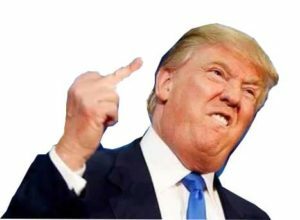 President Trump has a message for uninsured Americans, and Democrats are pouncing. As a political matter, the plan is indefensible; and yet, Trump is ostensibly putting it forward purely for politics’ sake. The federal deficit is expected to grow from $665 billion last year to $804 billion in 2018; cutting $15 billion off the latter sum isn’t going to make any significant difference in the nation’s fiscal health. And anyhow, the package appears to be dead on arrival in the Senate, where John McCain remains sidelined by terminal brain cancer, and Susan Collins has already signaled opposition to CHIP cuts. Thus, Trump’s proposal is a symbolic gesture that doesn’t actually advance the conservative movement’s substantive goals — but does undermine its electoral prospects. It’s a move driven by a desire to appease the Republican Party’s far-right flank, a contingent so tightly ensconced in its epistemic bubble it cannot recognize the strategic incoherence of its demands. Sometimes Trump’s fealty to that faction and its worldview leads to diplomatic blunders of historic proportions; other times, it merely results in what is, essentially, an in-kind contribution to the Democratic Party. …President Donald Trump’s decision in October 2017 to end cost-sharing reduction payments could also potentially result in the uninsured rate rising further. The cost-sharing payments have been made to insurers in the marketplace exchanges to offset some of their costs for offering lower-cost plans to lower-income Americans. The Republican tax plan remains about as popular as a poke in the eye, and evidence is mounting that giant tax breaks for rich people did nothing to goose the economy. If Democrats can use the unpopular tax plan as an anchor for messaging on rising health care costs and uninsured rates, they’ll have a powerful pitch for voters above and beyond the general discontent with Trump. And there’s not much Republicans will be able to do about it. Costs of Exchange insurance will be starting to trickle out over the next few months. That will catch people's attention as they consider if they can continue to buy insurance. Some parts of the country already have the initial requests going public — with increases of up to 90%.